RRB Allahabad Group D Recruitment 2018-2019 Notification is out for a while. Therefore Job hunters from the Uttar Pradesh State can check this Latest advertisement by the Railway Recruitment Board. So, the RRB Allahabad released this notification to hire 4762 Group D Vacancies. Therefore, all those contenders who are eager to make use of this chance can check this post, to find out all the important details. Accordingly, all the people who are willing to apply for the RRB Allahabad Group D Recruitment 2018-2019 should have some mandatory requirements. As per the information in the notification, the officials of the Railway Recruitment Board is looking for the applicants with certain educational qualification. All the applicants should have had done their 10th class or ITI or its equivalent from NCVT or SCVT in India as the Educational Qualification. Proceed to check other details, only if you have this correctly. The Officials of the RRB are going to accept the applications from the contenders only till the final date. As per the information in the RRB Allahabad Group D Recruitment 2018-2019 Notification, the closing date is 31st March 2018. While all the people can actually, start submitting the filled application forms from 10th February 2018. So, this RRB Allahabad Group D Recruitment 2018-2019 Notification is grabbing all the attention of the unemployed youth in the Uttar Pradesh State. Accordingly, the officials of RRB are very picky in considering the applications for these Grade IV Vacancies. Therefore, they are trying to choose the applications from the people, that are fulfilling all the qualifications. As per RRB Allahabad Group D Recruitment 2018-2019 Notification, the applicant’s age should be between 18 years to 31 years. Remember that along with educational qualification, the age limit is mandatory. Check the above-given table. 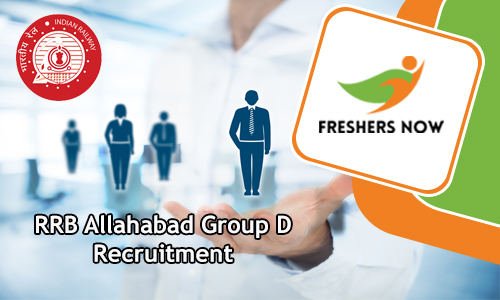 And table will give an overview of the requirements and other important details that are mentioned in the official RRB Allahabad Group D Recruitment 2018-2019 Notification. Check them all properly. Accordingly, the Officials of the Railway Recruitment Board will go forward to consider the application form, only if all the applications are having both requirements correctly. Check further for more details about the RRB Allahabad Group D Recruitment 2018-2019. So, basically, Track Maintainer Grade IV (Trackman), Gateman, Pointsman, Helpers in Electrical/ Engineering/ Mechanical/ Signal & Telecommunication departments, Porter & Other Posts comes under the Group D Category. Therefore, those people who are interested can check remaining details, and then proceed to apply for the Recruitment before the closing date. Now coming to the most important part of the RRB Allahabad Group D Recruitment 2018-2019 is Application Fee. According to the data that is specifically given in the advertisement, all the contenders should pay the application fee, before the final date. And the information in the advertisement, confirms that people should pay Rs. 500/-. While the SC/ST/Ex-serviceman along with the Female applicants should pay Rs.250/- as the Application Fee. Please consider checking the official RRB Allahabad Group D Recruitment 2018-2019 Notification, before making any kind of payment. And please remember that the information given on this page is only to refer. You can always check the official portal of the RRB Allahabad. Remaining important details are available further. So, we all know that many people might be looking for a single source, where they can depend on to get complete details. Now, this RRB Allahabad Group D Recruitment 2018-2019 Notification Post is made for such people. Here in this article, you can find each and every information that is given in the Railway Board Allahabad Group D Notification 2018-2019. And please remember that you all need to have all the qualification correctly, if not the officials will simply reject the application form. Now, coming to the part of the Selection Process. The officials of the Railway Recruitment Board Allahabad mentioned about the conducting of selection rounds. All the people who are eligible and have had all the qualifications correctly should participate in these rounds, to get the job. Written Test (Computer Based Test), Physical Efficiency Test (PET), Document Verification, Personal interview are the rounds. So, those people who will clear all those rounds will get the chance of getting a job. And remember that you will go to the next rounds of the process, only if you clear the initial one. Remember only the merit will be considered. Therefore, gather some preparation materials, and start your preparation as soon as you apply. And do not worry if you not able to find the correct place to get the preparation materials for the RRB Allahabad Group D Recruitment 2018-2019. Becuase on our site Freshersnow.com, you will find everything. And down in the next sections, all the mandatory details such as the Education Qualification, Age Limit, Age relaxation, Selection Process, Application Fee, Salary. Apart from all these, you will also find the steps that will help you to apply before the final date. And the people who get job will also get the monthly salary. As per the information in the RRB Allahabad Group D Recruitment 2018-2019 Notification, selected people will get the pay scale of Rs.18,000 Per month. And for Grade Pay and other incentives, you should check the official advertisement. And for the convenience of the people, at the end of this post, we even gave the direct link to download the RRB Allahabad Group D Recruitment 2018-2019 Notification. All you have to do is check the details. And then click on the link to download the advertisement. Follow the next sections for the outline of the RRB Allahabad Group D Recruitment 2018-2019 Notification. Go to the official site of the Railway Recruitment Board Allahabad at www.rrbald.gov.in.